The fight for survival goes on and on daily. In the streets all over the Philippines, every move you make is an act of survival. Our country is tough and to a certain extent dangerously charming. Even public transportation is risky business. The roads are still dominated by one vehicle, the jeepneys and their drivers. 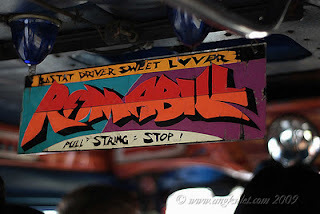 To ride a jeepney, you have to learn a few things to pull through. To ride one, the first thing you have to remember is finding them. 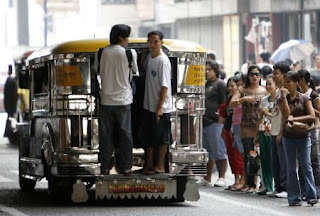 Try looking for the busiest roads and public places, you're sure to find jeepneys there. It never fails. Your next problem is getting to ride one. Just wave your hand as it comes, it will stop very near you. Here in Manila, frequently there's no need. 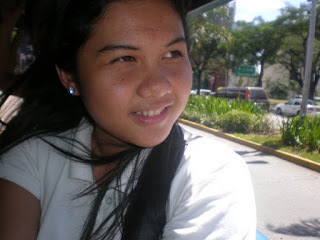 Stand by the road and look as if waiting for a ride, a jeepney will automatically stop in front of you. Its annoying really, especially if its not what you want to ride. Help your self up, sit down and brace yourself. But sitting down isn't always that easy as there are some passengers who could be just absent-minded or absolutely without a care in the world. They won't move when someone is about to sit on their side. It can be very annoying and it does happen a lot. Hang firm once you get seated. There are some "sabitan" you can grab and hold while the driver zips the jeepney through the narrow roads especially if it is "patok." A patok jeepney is described as a vehicle with drivers not wanting to go on low speeds. Its a good idea to hang on because jeepneys swerve and stop abruptly, often to pick up passengers the same way you got picked. Paying for your fare is supposed to be easy. With all those passengers riding with you, one is bound to reach for your money and pass it on to reach the driver, just don't forget to say "bayad po." This is the part that I hate the most, because not everyone seems cooperative. Some are sleeping or some are pretending to be deaf and wait for others to help instead. Grrrrrrrrrr! Patience is a virtue though, so politely say "makiki-abot lang po." If no one would still budge, I guess its ok to make a scene already, just be creative like shouting "ang di mag-abot ng bayad ko, mahold-up sana." Since the driver is too busy maneuvering the road to be 100% sure who pays vs who doesn't, he sometimes hire a "backride." It can be his friend, child, wife or kabet (mistress) on some cases. They help in calling the people to ride, collect the fare and scold stubborn passengers. Male backrides may also try to hit on pretty girls and try to charm them. Its a system that works just fine, but for those drivers who can't have assistance, they post stickers or signboards to change the minds of people who plan not to pay. Its not really that bad, not until the road bandits get in the picture. These local terrorists complicate the life of commuters. The snatchers, "holdapers," pickpockets and the others prey upon their victims by striking swiftly. Its just good news that chances of being victimized is very, very low. Aside from the fact that you cannot really distinguish who's good or bad from your fellow passengers (most bad guys operate in groups), you can't do much when things happen. Don't be like them throwing away their lives to earn quick but meager. If you're carrying a phone and a wallet with around a few hundred, give it to them and ask for your IDs. Perhaps they're that reasonable. Hang on, there's a few more to go. If you're a woman, you're both a problem and the one who will have a problem. You're going to be a problem if you wear your hair long free with the wind. Some poor passenger will have your hair all blowing to his or her face. And its not a pleasant experience! So please ladies, be mindful of your hair! The part where you'll have a problem (if you're a woman) also relates to hair. 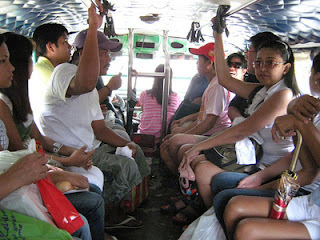 Traveling by jeepney ruins the hair, making it dry and lose its style. I've heard of girls ranting their hate for riding jeepney and getting their hair bad. Its the combination of sun, wind, dust and pollution which causes trouble. So if you spent a lot on your hair, better think twice before jumping aboard. Survival skills. They're yours now so the next time you ride a jeep, you'd survive or fare better than others but take note that the risks makes it all the more exciting. Its still about being street smart, after all you're still on the streets. I have my respect to the jeepneys. They're a caricature of the whole Filipino Culture. In its colors, the drivers, the passengers and the roads it travels, its largely Filipino living. The next time you ride, try to observe and be curious. You will discover plenty of things occurring while on a jeep is fascinating. To be truly Pinoy, you have to love our common way of transportation.